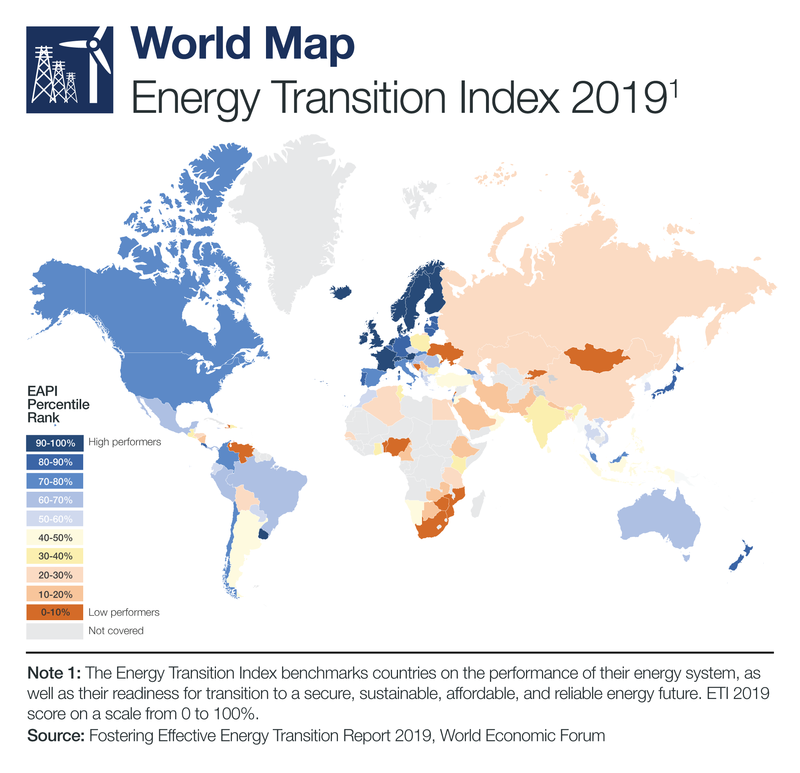 The need to accelerate the global energy transition is urgent, as highlighted by the World Economic Forum’s Fostering Effective Energy Transition 2019 report. 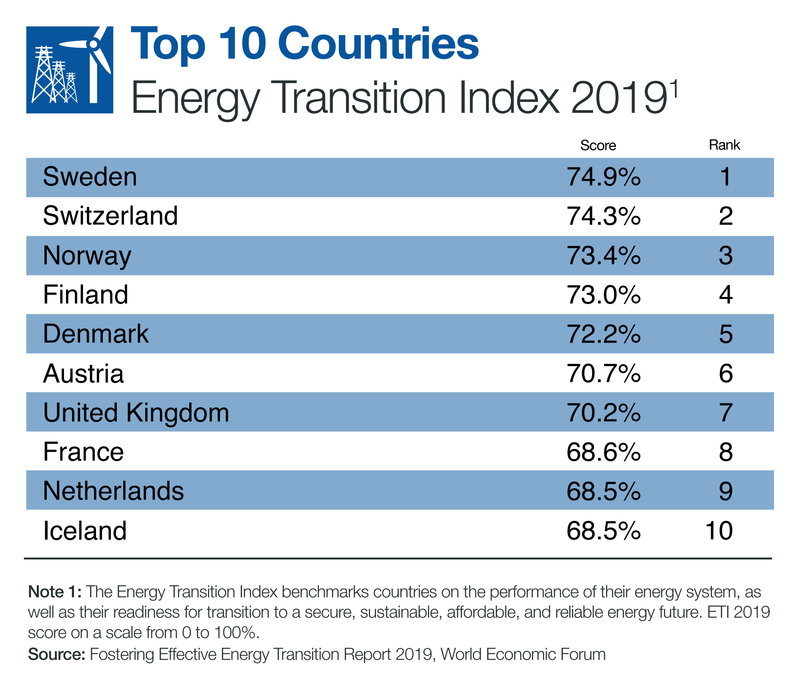 It summarizes findings from the 2019 Energy Transition Index (ETI), now in its eighth year. The purpose of the ETI is to establish a fact base on energy transition from which decision-makers can benchmark progress around the world. The ETI aggregates indicators from 40 different energy, economic and environmental datasets in order to provide a comprehensive, data-driven picture of the world’s energy system that can be tracked over time. The statistical model underlying the ETI is a rich source of information that can be explored to gain insights about a host of issues around the world related to energy transition. Last year was again a year of record-setting global warmth. An alarming report from the Intergovernmental Panel on Climate Change stressed the urgency of reducing greenhouse gas emissions. Despite this need for change, the ETI found that globally, the energy transition has slowed. The year‑on‑year increase of the global average score on the ETI was the lowest of the last five years. Three years after the global milestone of political commitment through the Paris Agreement, this lack of progress provides a reality check on the adequacy of ongoing efforts, and the scale of the challenge. The realization of the critical geopolitical dimensions of the energy transition is clear. Happily then, one of the positive findings of the ETI is around the areas of energy security and energy access. 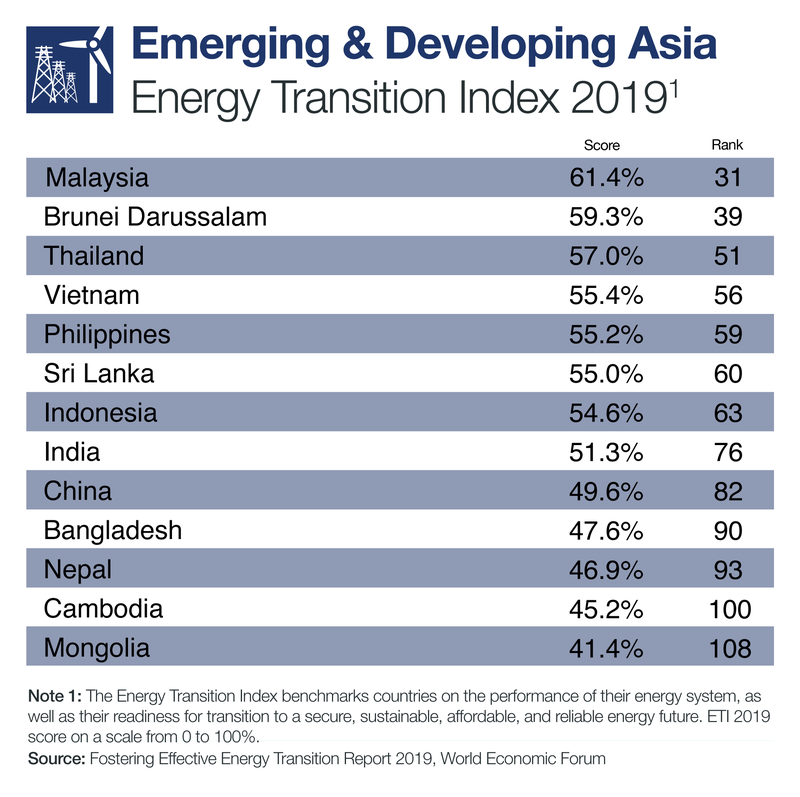 The metrics for these areas continues to show greater improvement, driven by strong gains in access to electricity in Emerging and Developing Asia and by increasingly diversified import counterparts among fuel‑importing countries. On average, 135 million people gained access to electricity every year between 2014 and 2016. While these access improvements are concentrated within large populations in Asia, improvements are happening more widely. Out of the countries analyzed that have not yet achieved universal electricity access, 90% experienced an annual gain according to the most recent data available. Kenya and Ethiopia in particular showed tremendous progress, improving electricity access by 14 and 9 percentage points, respectively. The Index data also sheds light on how the geopolitics of energy trade is shifting. The shale oil revolution in the United States and surging energy demand in China have been the key global drivers. Over the last 10 years of available data, net energy imports relative to total supply have decreased by 20 percentage points in the US and increased by 12 in China. In comparison, net energy import levels into European Union countries have remained relatively stable over the last several years. The report also shows the need for continued attention around balancing poverty reduction and economic growth with environmental sustainability. The complexities outlined in the report help explain why global carbon emissions grew in 2018, reaching an all-time high, and why the global consumption of coal increased over the last two years (driven by growing demand in India and China). This balance is not only needed in developing and emerging economies. The Index report points out that one in three US households struggle to pay energy bills, according to a recent survey from the US Energy Information Administration. Data from the World Bank shows the US has a higher level of income inequality than 33 out of 36 OECD countries. Income inequality has been getting worse in recent years, after levelling off in the early 2000s. Despite being the world’s largest economy and its largest energy system, the ETI ranks the US 27th overall and 89th in Environmental Sustainability out of 115 countries analyzed. The dual challenges of energy transition and economic equality facing the US are galvanizing support for a suite of energy and economic policy reforms captured in “The Green New Deal”. While the specific policies are still under development, the political momentum around these issues presents a grand opportunity. The success of a Green New Deal depends on its ability to reduce greenhouse gas and local pollution, while contributing to inclusive economic growth. As President, Franklin D. Roosevelt implemented the New Deal economic programmes that helped lift the US out of the Great Depression. His distant relative, President Theodore Roosevelt created the country’s system of national parks, forests and reserves, and established a conservative environmental ethic that spread throughout the world. Both approaches are needed, and more. Monitoring the energy transition, even if imperfectly, help informs global dialogue on the topic. This year’s ETI report shows a general lack of momentum, driven by stalled environmental improvements and mixed results in economic growth and development dimensions. That said, most countries are making significant achievements in the areas of energy access and security. Furthermore, there are many other positive stories to uncover when one digs into the specifics of different countries, and these can get lost in the aggregated Index. We encourage the reader to avail of the wealth of supporting data online.